The latest batch of Young & W!ld trainees, under the tutelage of Rodney Oliveiro and Serena Ho, is almost half of the previous batch. 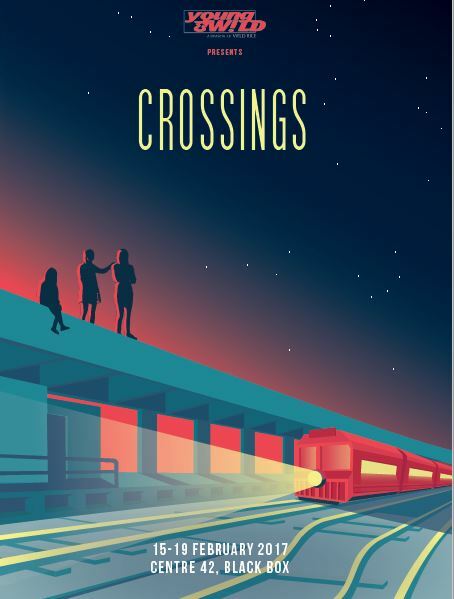 This piqued my interest when I found out that Crossings is a double-bill as I had two assumptions. First, this is probably a deliberate choice rather than an expedient way to ensure everyone gets a chance to perform (a problem faced by most training programmes). Second, it fits the main theme as the audience will get to go down two different paths and have two different experiences due to the choices of various characters. Alas, I am wrong about my first assumption. In The Mother, The Son, and the Holy Ghost, YouTuber and social justice warrior (SJW), Vix (Jasmine Blundell), decides that it is her calling to prevent an elderly lady (Natalie Koh)—suffering from dementia—from being kicked out of her house by her son (Aeron Ee). This is despite the fact that said lady accidentally caused her death. What ensues is a cross between a comedy of errors, and a supposedly poignant story of the difficulties a caregiver has. Unfortunately, any potential that this piece might have is cut short, and the convenient ending feels like an apology for delaying the entrance of the actors in the next piece. Such an apology is an utter waste as Jasmine Blundell is annoying but endearing as Vix. Aside from her engaging performance, she deliciously plays up every antic that popular YouTubers do in their videos. Natalie Koh pairs well with Blundell as the elderly woman. Koh strikes the right balance in portraying an elderly lady without resorting to the feeble stereotypes. Together, they could be an unlikely duo going on wacky adventures. Unfortunately, the piece is derailed by the son, Boon (Aeron Ee), who is stiff and yells in every scene. Compared to Ee’s vein-popping histrionics, a pantomime dame feels Chekhovian. Arbitrio starts off with another odd character. We encounter a Moses-like figure (Mel Bickham), seemingly at an audition, reciting Bible verses. In his desperate attempt to impress the unseen panel, he unfurls a story he has written about the twist and turns of a marriage. This odd premise keeps the audience in anticipation for a good plot twist or revelation, but it does not materialise. While one’s interest is buoyed up by a series of jokes and wordplay, the trajectory of this piece feels like riding a donkey around a roundabout. The paper-thin dialogue is filler before an opportunity to put in the next punchline arises. Additionally, the premise of an author figure writing and changing the story is puzzling. Does it mean that the choices of the characters do not really matter? Isn’t that going against the idea of the characters being at a critical crossroads in their lives? Nothing seems to be carefully considered and promising aspects that the actors (Alison Bickham, Mel Bickham, Sharmaine Goh, Krish Natarajan) could have worked with—such as Chris (Krish Natarajan) being a bigot as he fumes about his friend coming out as gay just before his wedding—are not factored into the later scenes. Coupled with generic portrayals, and the intrusions of the author figure preventing the audience from being emotionally attached to any of the characters, Arbitrio is arbitrary. While there is potential in this batch—and every bit of it should be encouraged—one should not let it discount the fact that this showcase is, on the whole, ho-hum.